Do you ever just need to create a quick outline by eye without thinking about the size. This macro can quickly create outlines and shadows with a couple mouse clicks. Round corner options, Beveled corner options and default corner options are your choice. Just select a shape (combined, grouped, whatever) and place 2 clicks for outline/shadow distance. Place the first click on the shapes edge and place the second click the distance you want the outline created. Presto! The contour is automatically placed, separated and filled in the color of your choice. Your choice of fill and outline color comes in handy too. 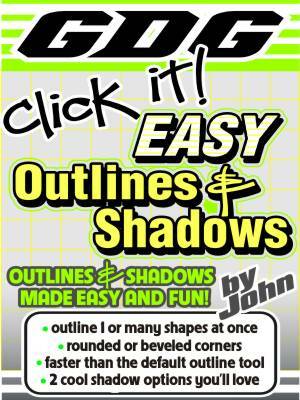 Outline color choice is popular for sign makers so you can instantly create a cut contour line around your shapes. Other options include the ability to remove interior holes so you can make a contour around a shape and not the inside. Make it easy on yourself...try this one! 1) Check your settings. Check your distance value and or use click mode. 2) Don't apply an inner contour that's too large. You can apply larger inner contours if the "remove interior holes" checkbox is clicked. 3) Try a different size contour. 4) Try resizing the shape and then try again. Some small bugs relative to CorelDraw itself can cause errors. * Although the macro can do multiple shapes at once, due to the large number of posiblities this could be more unpredictable than doing a shape at a time. Note: try ungrouping your multiple shapes before applying the effect. *Usually the "remove interior holes" will work faster. You may want to use it first, especially on complex shapes. *Complex and super complex shapes can take ALOT of time to create the effect. Either wait or backup your work before applying effect to super complex shapes. This Corel Draw core related and has nothing to do with macro itself. Fill not being applied: This is a CorelDraw related bug. Make sure the shape you are contouring has a fill and your effect will have a fill as well. NEW! Try the outline color feature combined with the "remove interior holes" function to add quick cuttable lines for those using vinyl cutters that recognize a certain color as the "cut contour". Give your self some time to become comfortable with the macro and I'm sure you find it to be a great tool.